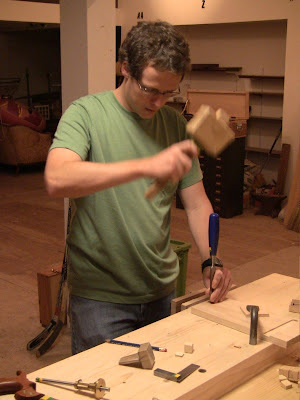 This past Wednesday I taught the sixth class at the Close Grain School of Woodworking, dovetails, with Reeve Goodenough. Reeve chisels the waste out of the tail board. 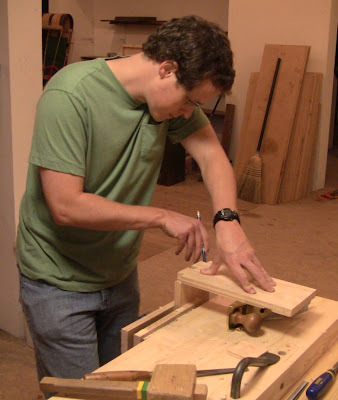 I demonstrated a single-tail joint, tail-first, using a chisel to remove the waste. Single tails are a nice quick practice to test your ability to match one set of cuts to another. 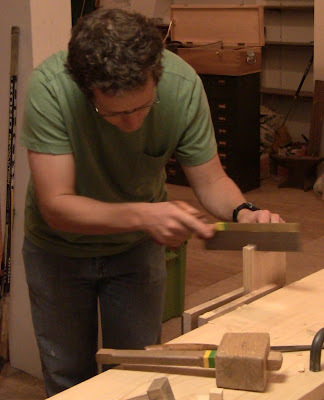 Then I made a two-tail joint, pins first, using a coping saw to remove the bulk of the waste, followed by a chisel to pare out the remainder; using hand pressure on the chisel, this is the quiet option for people who don't want to disturb the neighbors. Last, I made a two-tail half-blind joint, using just a chisel to remove the waste; this has to be done tails first. Then I had Reeve do a few practice saw cuts to get the feel for it. 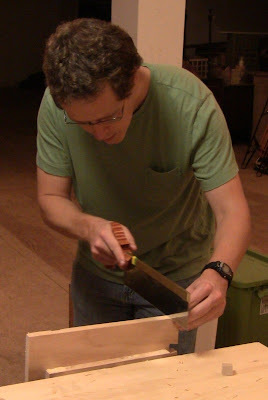 The secret to clean, efficient dovetails is precise sawing. It's possible to repair a large gap by filling it with a wedge or shaving, and you can pare down if something is too tight, but those are both time-consuming and risk making things even uglier. Careful sawing makes it fit right off. This is a matter of control that only comes with practice. Every saw cut has a square axis and an angled axis. It's critical to get all the square directions perfectly square. The angled directions on the first piece are less critical, because they form the pattern to which the other piece will be fit. The final matching angled directions on the second piece are then as critical as the square directions. 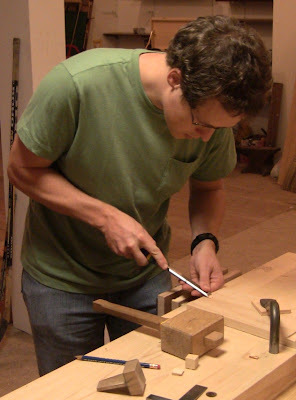 For his joint, Reeve made a two-tail full dovetail, tails first, using the chisel to remove all the waste. Once you have this process down, you can extend it to as many tails as you like. The difficulty increases with the number of surfaces that have to match up, but again good sawing is the key. Trying to pare and fit 4 or more poorly-sawn dovetails will drive you batty. Levering out a bit of waste. Sawing off the end waste. Transferring the tails onto the pin board. Sawing just to the waste side of the lines. As Reeve test-fit his joint, I could just hear it slip snugly into place. That's a very satisfying sound. Nice job, Reeve! 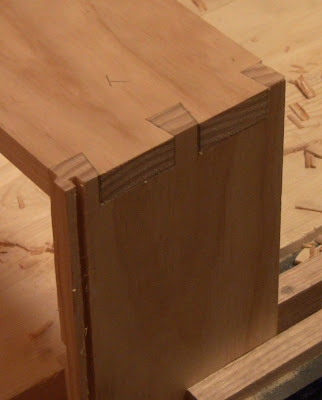 Now that's one fine dovetail joint! Ignore the groove, this was a piece I had demonstrated something else on. This completes the current summer series of classes, but you can still schedule a private class before it gets too cold to work in the barn.